Conservationists working to preserve caribou populations in the Arctic may have the best of intentions, but they’re hampered by a shortage of scientific data on how to appropriately manage these dwindling populations. 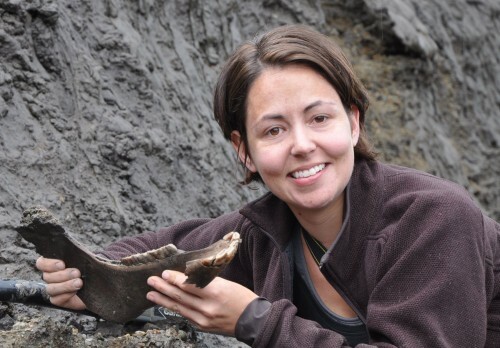 Researchers on a project funded by the National Science Foundation hope to remedy this situation by studying the population fluctuations of three large arctic mammals — and in two of the cases their eventual extinction — over the past 700,000 years. The group, led by Penn State University Biology Professor Beth Shapiro, is taking DNA from the bones of caribou, as well as from extinct arctic horses and steppe buffalo to track the size and strength of their herds over time. This information is correlated with data about temperature, plant availability and animal competition in those areas at the time when the animals were living. “Ancient DNA provides the mechanism to go back in time and to watch populations change as their environment changes,” Shapiro said. The research will provide conservationists with tools to understand how to better protect today’s animals. One of the main questions is how much human impact is to blame for declining populations. The group finished the first of three messy field seasons this summer tramping through the Yukon mud. They’re visiting different active gold mines each summer to collect bones as the miners unearth them from the permafrost. Furthermore, the Klondike region where they’re focusing has an added benefit. Layers of volcanic ash from Aleutian eruptions settled there over the millennia. Scientists can accurately date those layers, which makes it easy to date the bones that are unearthed within them. Collaborator Grant Zazula, Yukon palaeontologist with the Canadian Department of Tourism and Culture, describes the work as “running around the smelly, frozen muck looking for bones.” One of the highlights this summer, he said, was finding a five-foot-long wooly mammoth skull with matching six-foot tusks. 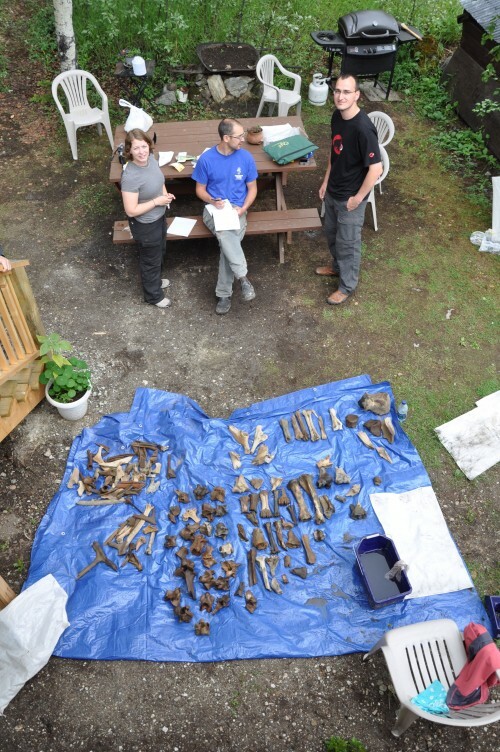 While that exceptional find didn’t help with the study, the group did collect its goal of 50 bones from each of the three species at each mine. They’ll extract DNA from these bones back home in the lab. The rule of thumb is that the more genetic diversity in a population the larger that population is. So the scientists track the ups and downs through that DNA diversity. The project grew out of an earlier one that included some of the same collaborators who were looking exclusively at bison. Bison in North America today have little genetic diversity. The easiest theory to explain this is that when humans showed up, we killed off so many of them. But the DNA research showed that bison populations started declining 35,000 years ago, which is 24,000 years before humans appeared on the scene. “It seems like, at least with bison, humans are off the hook,” Shapiro said. Another theory is that large mammal populations ebb and flow with each global warm and cold cycle, of which there have been many in the past couple million years. Because the bison study relied on radiocarbon dating, which can go back only 50,000-60,000 years, the scientists could only see the end of the most recent cycle. Perhaps every time global temperatures cool, populations decline; and then they rev back up when it warms, Shapiro said. The current study is an effort to gather data to explore that theory. The mines are unearthing bones that are about 80,000 years old, 300,000 years old and 700,000 years old. The group chose the three animals they’re studying because they were the three most abundant large mammals in the Arctic. Arctic horses went extinct about 10,000-12,000 years ago and bison went extinct there about 2,000 years ago, Shapiro said. Among the things they hope to learn, Zazula said, is whether some species responded well to warming, and if so whether that was because they acclimated to the changed climate or because of reduced competition for food. Also, they hope to learn about the bison and horse populations leading up to their extinction. Were they in steady decline or were they doing well and then suddenly crashed? With caribou, it will be useful to learn whether their declining populations today are part of a steady decline since the end of the last ice age or if it’s something that might be newer and presumably related to humans. Shapiro explained that conservationists could use the research to understand which caribou populations have already tipped toward inevitable extinction, which would allow them to focus on populations that seem more likely to survive.